We strive to make the outdoors fun, comfortable and accessible to everyone. Campsmart is a family owned and operated business. We grew up camping, with long spells in the bush free camping and trekking. This type of childhood kick started a love of the outdoors, travel and adventure. As young adults we took this sense of adventure around the world, camping and trekking across the globe. From Spain to Bolivia and beyond. Kids arrived and still we kept camping. Several years ago we took our own camper trailer "Gary" on the road for several months. Without realising it at the time, that trip started the begining of a whole new adventure. Gary gave us time to think. We loved travel, we loved the outdoors, we loved adventure and we wanted assist others to experience that same. We decided to throw caution to the wind and find a way to work in our passion. We decided to give up our successful corporate careers with large organisations and dedicated ourselves to further develop and build Campsmart. With a passion for the outdoors and a desire to test most of the products (as often as possible ) enabling the highest level of customer service and product knowledge. We have built our business to what it is today with dedication and care. Have a look at our customer feedback. We are not a large corporation, we are a small business fuelled on a love of the outdoors, camping and caravanning. We can give you hands on advice, great prices and even better service. Our Sydney office stocks some of the best known brands in the business. We’re known for providing great products which we use and trust ourselves. The cost savings achieved through our unique honest approach are directly passed onto our customers which offers outstanding value for money across our range of products. – See our recently added products. We love working for our customers & look forward to helping you with what you need for your next big adventure. 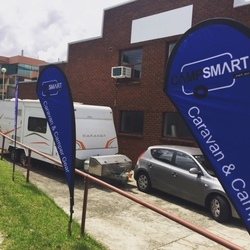 Campsmart is an online business located in Gladesville Sydney. We ship Australia wide straight from our warehouse. This allows us to keep our overheads low and our product prices reasonable.